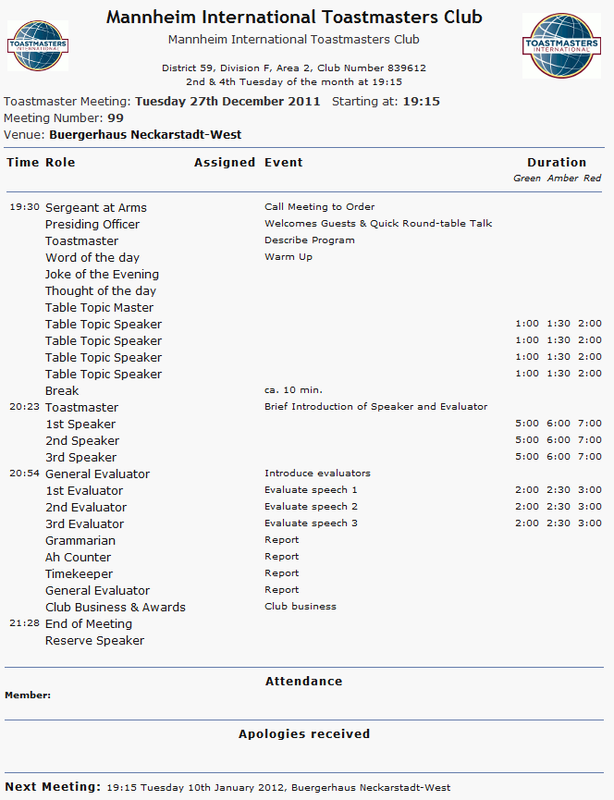 A typical Toastmasters meeting is divided into three parts: Warm-Up, Prepared Speeches and Evaluations. While the exact structure of the meeting varies from club to club, there are multiple elements common to every Toastmasters meeting worldwide. We have several roles taken by participants at Toastmaster meetings that help fulfill specific tasks. 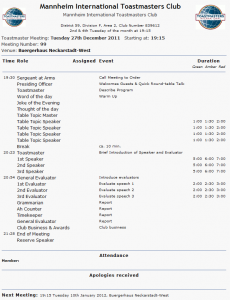 This article explains the structure of the meetings at Mannheim International Toastmaster Club. Our meetings are usually scheduled for 2 hours, starting at 19:30. The meeting is started by the Sergeant at Arms who calls the meeting to order and hands over to the Presiding Officer. The links will explain these roles in more detail. After greeting the attendants and asking guests to introduce themselves, the Presiding Officer will start the meeting with a quick round-table talk. A question is asked and each participant in the meeting should answer in about 30 seconds. This helps us to get started talking and also to get to know each other a bit better. The Presiding Officer then hands over to the Toastmaster of the Evening. The warm-up continues with the Word of the Day. This is a useful word for us to know that we do not usually have in our vocabulary (at least as non-native speakers of English). The participants of the meeting can then try to use this word which will be positively acknowledged. Afterwards a Joke of the Evening is given to make us laugh and warm up more. Another smaller role that follows is the Thought of the Day that can give us something to think about after the meeting. The meeting continues with Table-Topics, a section that is “feared by some and loved by others”. Table-Topics is about giving impromptu, spontaneous speeches. The Table-Topic Master has prepared multiple questions – sometimes arranged around a specific theme – which they will ask the audience. Then they will pick someone to answer this question in 1 to 2 minutes time. Please note that as a guest you do not have to participate, but you can if you like (and if you are asked to). Also, you should try to answer the question, but you do not need to – you could digress from the topic and talk about something entirely different. Here you can find more tips on Table-Topics. We usually have 4-6 participants called up to speak. Afterwards, the timer will report on whether the speakers stayed in time and then we vote for the best Table-Topics speaker. The Toastmaster of the Evening will then announce a break. The meeting proceeds with its second part: Prepared speeches. Speeches are prepared according to different Communication Manuals. These manuals are distributed by Toastmasters International and contain several speech projects. New Toastmasters always start out with the Competent Communication Manual that comprises 10 speech projects. Most of these speeches have a time of 5 to 7 minutes. We usually have 3 to 4 prepared speakers. As an example, the first speech project of a new member is called “The Ice Breaker”. In this project, the speaker should introduce himself or herself to the audience and structure the speech into a beginning, a body, and an end. After each speech there is time for feedback. Every member can write down some positive remarks and suggestions for improvements on a sheet which will give additional feedback to the speaker. After all the speeches have been given, the timer will report once again and we will vote for the best speaker. Now the Toastmaster of the Evening will hand over control to the General Evaluator for the third part of the meeting: Evaluations. Each prepared speaker has an Evaluator assigned who will give the speaker a written evaluation of the project in his manual, but also a verbal evaluation. For this evaluation speech the evaluator has a timeframe of 2 to 3 minutes. The evaluator will highlight the strengths of the speaker and the things that were done well and give few suggestions to make the next speech even better. After all evaluations were given, the timer will report for the last time and we will vote for the best evaluator. Now the Ah-Counter and the Grammarian will give their respective feedback to the participants. Afterwards the General Evaluator will give feedback to the roles who have not yet received any dedicated feedback. The General Evaluator will also give suggestions to improve the meeting in general. At the end, they will hand back to the Presiding Officer. The Presiding Officer will handle the Club Business section which includes announcements and decisions to be made. Awards are handed out for the best Table-Topics speaker, best prepared speaker and best evaluator. After the meeting we usually meet at a pub close-by and have a drink together. Now if you read all of this, why don’t you take a look at the agenda of our next meeting?